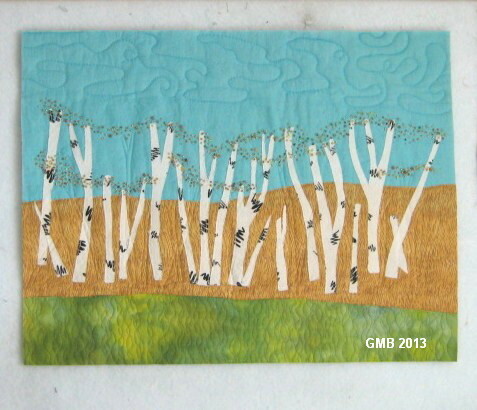 Having had my fun with my first big give-away this morning, I turned my hand to "Tree Line". I finished the beading yesterday afternoon; here it is, trimmed and on the design wall. After using the usual 1/4" seam, I had to trim and grade the seam allowances down by at least 50% to enable me to roll the binding (1.25" wide, folded in half before applying) over to the back side to stitch down. Using a tip from Ann Petersen, my Craftsy tutor for "Quilting Big Projects on a Small Machine", I then took my fine, small scissors and trimmed the batting around the corners to further reduce the bulk. 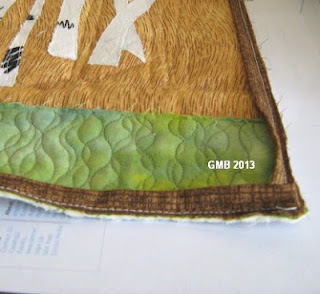 My task this afternoon is to hand-stitch the binding to the back. As I work, I'm listening to CBC 2 'Shift'...and taking inspiration from Judith Martin, who earlier today wrote THIS...and I'm linking up with Nina-Marie and the gang for Off the Wall Friday. I like that thin line binding you've used. Just this afternoon, I'm doing a skinny binding (1/8") on a smaller project. I used a single layer, cut 7/8" wide, and am now stitching it to the back. I think it's worth the fiddly work to make a clean edge like that. Thank you so much for visiting my "Memory of Trees" post. I have a very inexpensive embellisher. Only 5 needles, but I love it. They are more expensive now. I would recommend the one with 6 needles and I have heard that the most popular one is a Baby Lock. Love the details! I'm curious about the thin line binding.